T-Mobile kicked off a new promotion today that lets new and existing customers get the 64GB iPhone XR at no extra cost when they add new voice lines and trade in a qualifying device. Specifically, the promotion is for up to $750 off the iPhone XR over 36 monthly bill credits at $20.84 per month. You can also put the $750 credit towards an iPhone XS or iPhone XS Max to reduce the price of the smartphones. New customers will need to activate two new lines of qualifying service, one of which needs to be used with the new device being purchased. Existing T-Mobile customers will need to activate at least one new line of qualifying service to be used with the new device. Secondly, you'll need to trade in one of the following eligible devices in good condition: iPhone X, iPhone 8, iPhone 8 Plus, iPhone 7, iPhone 7 Plus, iPhone 6s, iPhone 6s Plus, iPhone 6, or iPhone 6 Plus. 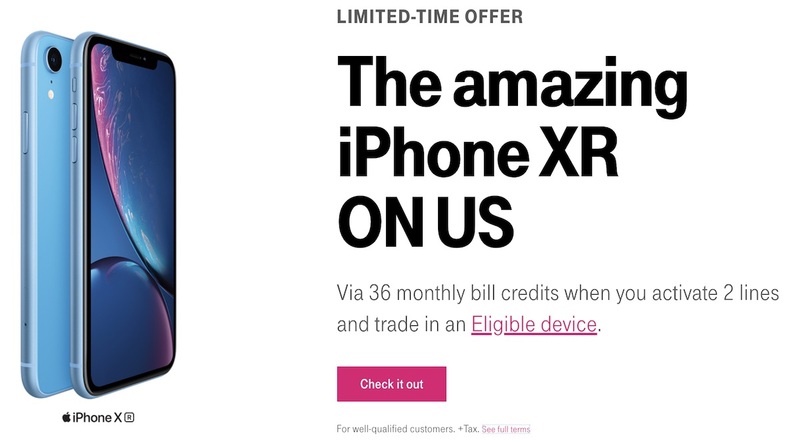 T-Mobile notes that this offer is available both in store nationwide and online at T-Mobile's website, but it'll only last for a limited time. If you have access to Costco, check there for a similar promotion. I did back in November, traded in iPhone 6s for $50, added a line, received a MasterCard debit card with $700 about 20 days into the new line, and cancelled new line. Used Apple Pay Cash to deposit MasterCard debit card to checking account. iPhone XR 128 GB cost about $80 after rebate. Just make sure you keep an eye on your bill. T-Mobile often fails to apply the credit now and then, necessitating a call and about ten minutes of your life. Just seems to me that 36 months is a long time to recoup $750. Too bad new lines need to be added. I would buy 2 XRs if you could trade in 7’s. Couple of years ago you could get the whole cost of a 7 covered with even a 5c trade in. No more of that. Once the merger gets approved, they’ll even have less reasons to be a market disruptor. I wouldn’t be surprised they have a repercussion for using a prepaid debit card early to payoff the lease early and cancel lines. I understand that T-Mobile can claim they have new subscribers, but wouldn’t they crack down on the subsidy usage? Or in my case back with the iPhone 7, it took 9 months, about 15 phone calls and easily 15 hours of my time, and eventually a letter to the executive team to finally get my monthly credits. That was incredibly frustrating. All just factors to consider. The onus is on them to adjust the kerning. hahaha I thought the same thing when I read it.... "onus...?....Ohhhh! On Us!" Spoke to T-Mobile, the new line must remain active for the period of the promotion i.e. 36 months, it boils down to 390 discount instead of the 750 as advertised.